Intrinsic Muscles of the Hand are short muscles whose origin and insertion is enclosed within the area of the hand. These muscles make possible the skilled movements of the hand and also help the hand in adjusting for proper gripping. There are 20 intrinsic muscles in hand. These muscles comprises of small motor units which enables the hand to act with accuracy and to carry out skilled movements. They are three in number, viz. Abductor pollicis brevis lies laterally. Flexor pollicis brevis lies medially. Opponens pollicis lies deep between the above two muscles. They form thenar eminence of palm of the hand. They are chiefly responsible for opposition of thumb. All of them are supplied by the recurrent branch of the median nerve (C8, TI). The actions of thenar muscles are indicated by their names to some extent; but they all are involved in opposition providing pincer-like grip between the thumb and index finger. They are also three in number, viz. Some authorities also consider palmaris brevis as one of the hypothenar muscles. Abductor digiti minimi lies medially. Flexor digiti minimi lies laterally. 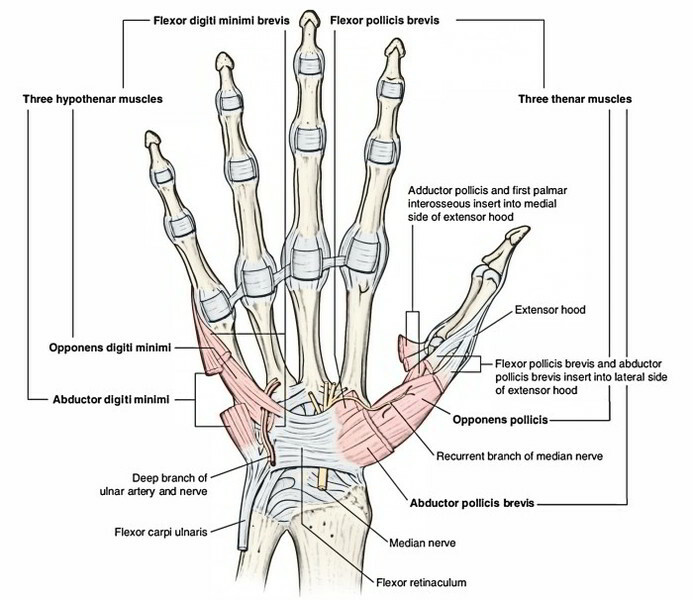 They form hypothenar eminence of the palm of the hand. All of them are supplied by the deep branch of ulnar nerve. 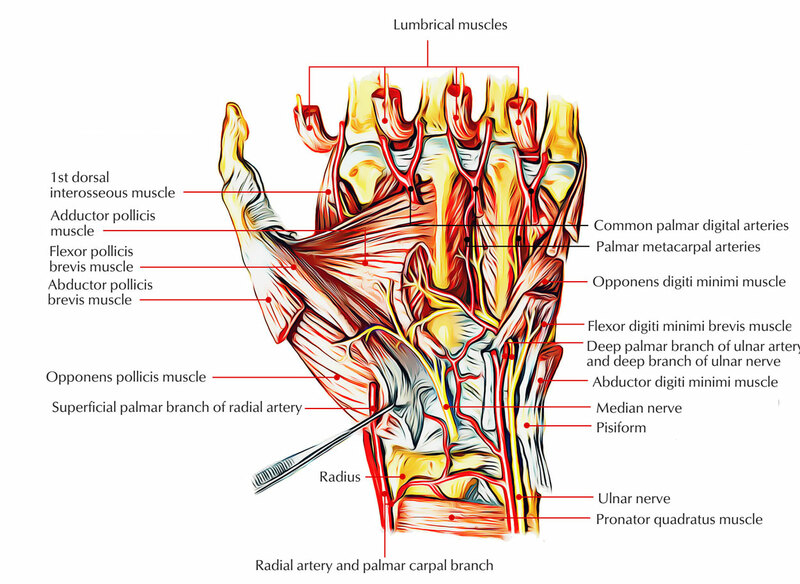 The flexor pollicis brevis has dual nerve supply: superficial head by the median nerve and deep head by the deep branch of the ulnar nerve. Tendons of insertion of the flexor digiti minimi along with the abductor digiti minimi on the medial side of the base of first phalanx contain a sesamoid bone. This fan-shaped muscle is located deep in the palm in contact with metacarpal and interossei. It consists of two heads: (a) oblique and (b) transverse. Oblique head arises from anterior aspects of capitate bone and bases of second and third metacarpal bones— forming a crescentic shape. Transverse head arises from ridge on distal two-third of the anterior surface of the shaft of the third metacarpal. Into the medial side of the base of proximal phalanx of the thumb. Deep branch of the ulnar nerve (C8, TI). Adduction of the thumb to give power to the grip. The tendons of insertion of adductor pollicis on the medial side of the base of proximal phalanx of the thumb contain a sesamoid bone. The deep palmar arch and deep branch of ulnar nerve pass between the two heads of adductor pollicis. Give the patient a thin book and ask him to grasp it firmly between the thumbs and index fingers of both hands. If the muscle is healthy and acting normally, the thumbs will be straight. But if the muscle is paralyzed and not acting, the thumbs are flexed at IP joints. This occurs because when adductors are not acting, flexor pollicis compensates for it. There are four lumbrical muscles and numbered first, second, third, and fourth from lateral to medial side. They are small slender muscles one for each digit. They are named lumbricals because of their elongated worm-like shape (L. lumbrical = earthworm). Lumbricals 1 and 2: From lateral side of lateral two tendons of the flexor digitorum profundus. 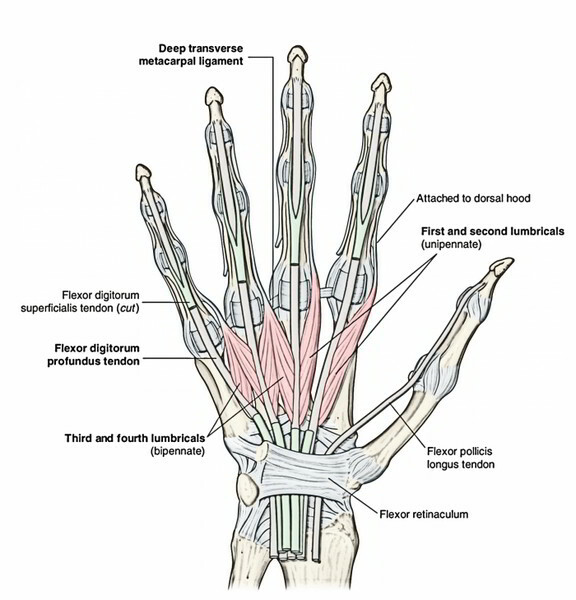 Lumbricals 3 and 4: From adjacent sides of medial three tendons of the flexor digitorum profundus. 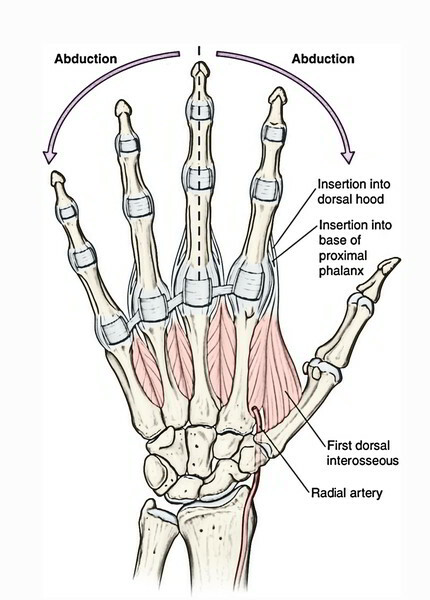 The tendons cross the radial side of metacarpophalangeal (MP) joints to be inserted into the lateral side of dorsal digital expansion of the corresponding digit from second to fifth. First and second lumbricals by the median nerve (C8, Tl). Third and fourth lumbricals by the deep branch of the ulnar nerve (C8, Tl). Lumbricals flex the metacarpophalangeal (MP) joints and extend the proximal and distal interphalangeal (PIP and DIP) joints. The eight small interosseous muscles, as their name indicates, are located between the metacarpals bones. They are arranged into two groups: palmar and dorsal. Palmar interossei are four small muscles, located between the palmar surfaces of the metacarpals. They are numbered 1-4 from lateral to medial side. Dorsal interossei are four small muscles located between the shafts of the metacarpals and numbered from 1 to 4 from lateral to medial side. There is one muscle each for first, second, fourth, and fifth digits but not for the third digit. All The palmar and dorsal inLerossei are supplied by the deep branch of the ulnar nerve. Palmar interossei adduct the digits whereas dorsal interossei abduct the digits. 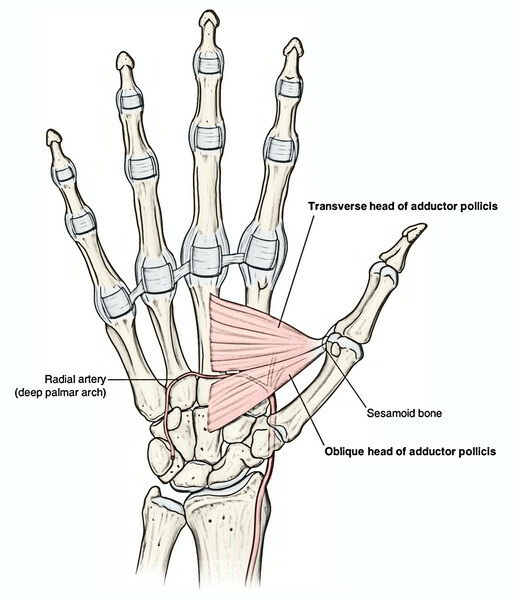 The axis of adduction and abduction passes vertically through the center of middle finger. A mnemonic to remember the action of interossei is: Palmar ADduct (PAD); Dorsal ABduct (DAB). Acting together, the palmar and dorsal interossei and the lumbricals produce flexion of metacarpophalangeal (MP) joints and extension of proximal and distal interphalangeal (PID and DIP) joints, this action is termed Z-movement. The palmar interossei are tested by asking the patient to grasp the paper between two adjacent fingers. If muscles are healthy and acting properly the paper will be firmly held and some resistance is offered when the clinician tries to withdraw it.